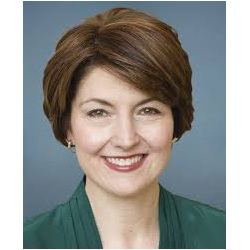 Biography: Cathy McMorris Rodgers is Eastern Washington’s chief advocate in Congress and a rising star in American politics. Since first being elected to the House in 2004, she has earned the trust of her constituents and praise on Capitol Hill for her hard work, conservative principles, bipartisan outreach, and leadership. As someone who grew up on a farm, worked at her family’s small business, and later became a wife and mom of three, Cathy has lived the American Dream, and she works every day to rebuild that Dream for our children and grandchildren. As Chair of the House Republican Conference, she is the fourth highest-ranking Republican in the House and the highest ranking woman in Congress. In 2010 she was appointed to the powerful House Energy and Commerce Committee – where almost half of all legislation pertaining to the economy must pass. She currently serves on the Health Subcommittee, where she plays an active role in advancing affordable, patient-centered health care reforms. Of the 72 bills signed into law in 2013, Cathy authored two of them: the Hydropower Regulatory Efficiency Act (which unanimously passed in both the House and Senate) and the National Pediatric Research Network Act of 2013. Both bills expand opportunities for families in Eastern Washington. A longtime advocate for members of the military and their families, she co-founded the bipartisan Military Family Caucus to provide military spouses and children a voice in Congress. Cathy is also the Co-Chair of five Congressional caucuses: Military Family, Down Syndrome, Lumber, Neuroscience, and the Rural Health Coalition. In January 2014 Cathy delivered the Republican address following the State of the Union, in which she articulated a hopeful, bold Republican vision that will make life better for the American people. In 2006, Cathy married Brian Rodgers, a Spokane native and retired 26-year Navy Commander. In 2007, she gave birth to Cole McMorris Rodgers. Since Cole was born with Trisomy 21, Cathy has become a leader in the disabilities community. She has also welcomed two daughters into the world – Grace Blossom (December 2010) and Brynn Catherine (November 2013). She is the only Member of Congress in history to give birth three times while in office.